The Pacific Northwest coast has a long history of Native American Indian basket making with excellent examples being made by the Salish Indians and Tlingit Indians who made many interesting styles including hats, bags, utilitarian baskets as well as early tourist pieces. Whaling scenes were commonly woven into the design of Northwest Coast Indian Baskets. Examples of Northwest Coast Native American Indian baskets include Alaskan Baleen Baskets, Tlingit Baskets, Salish Baskets, Makah Baskets, Klamath Baskets, and Attu Purses. 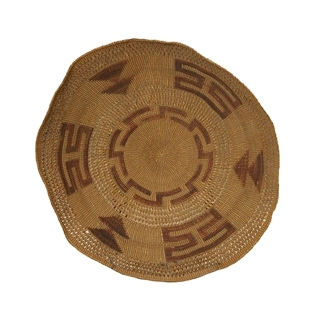 Thompson River Basket, c. 1940, 11.5" x 14" x 10.5"